Lamb supplies for the week ending July 6 stood at around 63,000 head, which is around 7,000 head or 13% higher than the corresponding week in 2013. Increased pressure is starting to be exerted on lamb prices, according to the IFA’s latest update. It says its members are reporting pressure on quoted prices with factories paying €4.70/kg to tops €5.00/kg today. Latest data from the Department of Agriculture, Food and the Marine shows supplies for the week ending July 6 stood at around 63,000 head, which is around 7,000 head (or 13%) higher than the corresponding week in 2013. Cumulative supplies are around 1% higher than 2013 figures standing at around 1.19 million head. 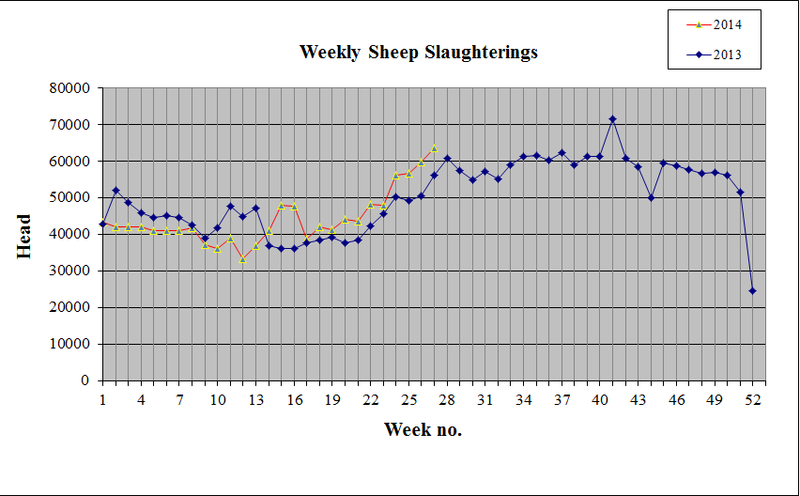 The last four weeks has seen a surge in lambs coming forward for slaughter with over 235,000 head being killed in that period. Latest reports from Bord Bia suggest that trade remains mixed across our key export markets. In Britain trade has seen a downward trajectory with prices reduced as a result. The SQQ live price for new season lambs in England and Wales was making the equivalent of around €5.40/kg dw during the week.